Just a quick note to wish all my American Blogger friends a very Happy Thanksgiving. I hope you have a wonderful day with your family and friends. 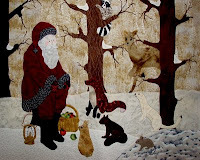 On the quilting front, I've finished the applique on another Woodland Christmas block. This one will be called "Have You Been Naughty or Nice? ", and will be the 6th in the series. I'm not sure what I'm going to do for the border yet. Probably something pieced. Simply lovley. I'm in awe of your talent! We had a grand thanksgiving - not all the kids could be here but we had fun anyway and made lots of long distance phone calls. Oh how I love cell phones and free long distance. Oh Dorothy, this is so lovely design, and I love the colours so much! I can't wait to see the whole design! Dorothy.. it is beautiful your scenic background fabric and your fabs you picked for the animals are just perfect.. I can see why your "creative room" is the way it is how else are you going to find what you are looking for?? We are waist deep in the white stuff. Thanks for the comment about my tree. I have a nice assortment of all types. I like sentimental decorations and objects. Absolutely gorgeous applique block. Love all the animals with Santa! The animals are so sweet.